No surprise: Japan and the Republic of South Korea lead the world in using mobile phones to access the Internet. What is noteworthy is that for the first time a methodological framework has been used to rank countries by mobile Internet penetration. 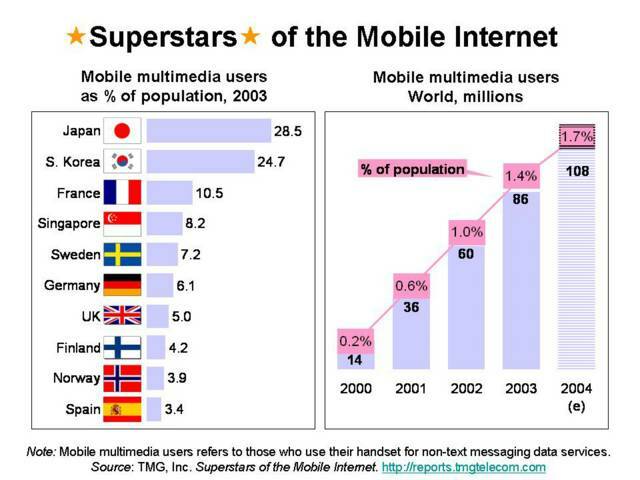 A new report, Superstars of the Mobile Internet: Top ten mobile multimedia nations, calculates the number of mobile Internet users for 45 major economies comprising over 90% of worldwide mobile subscribers. The report argues that the term mobile multimedia user is preferred when describing people who use their mobile phones (or mobile networks) to download entertainment, exchange picture messages and access the Internet. That is because some of these activities may not necessarily involve the use of the Internet but do require a higher degree of sophistication than sending simple text messages. Perhaps surprisingly, France ranks third in the world. The French telecommunication regulator, ART began reporting the number of mobile multimedia users in March 2004, when it noted there were 6.7 million. These statistics are featured in its mobile observatory quarterly releases. ART supplies a fairly detailed definition of mobile multimedia user. Apart from Japan and South Korea, the only other Asian nation in the top ten is Singapore. The other countries in the top ten are all from Western Europe--either large nations such as Germany, Spain and the UK or Nordics such as Finland, Norway and Sweden. 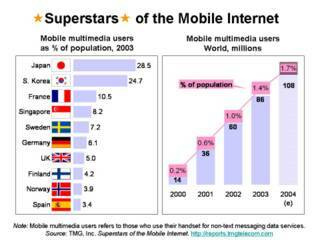 The report estimates that there were 86 million mobile multimedia users around the world in 2003. Data used in the report were compiled from official sources such as government regulatory agencies, mobile operators and national statistical offices. Considerable time was spent on sorting out different definitions, data formats and derivations to arrive at a comparable data set. A key feature of the analysis was comparing operator reported administrative records with national statistics office surveys. The report proposes a set of key mobile multimedia indicators that operators and regulators should consider collecting to enhance comparability.